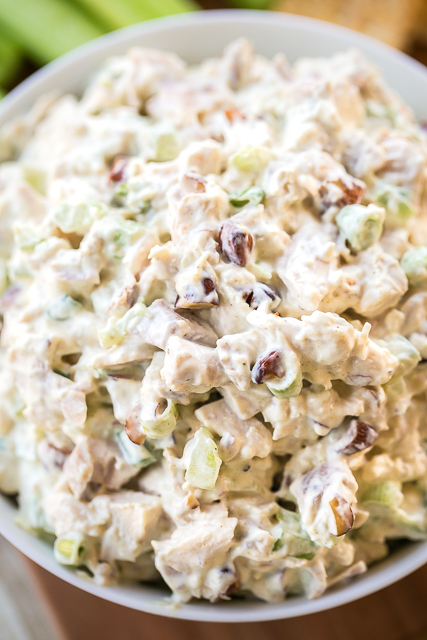 Olexa's Chicken Salad - This is THE BEST chicken salad EVER!! SO good!!! Chicken, mayo, sour cream, celery, curry, salt, pepper, lemon juice, green onions and smoked almonds. Copycat recipe from the Birmingham, AL restaurant. I think this version is better than the original. Keeps for up to 5 days in the fridge. One of our favorite lunch spots in Birmingham is a place called Olexa's. It is an amazing bakery with a super cute cafe inside. All of the food is great! Especially the Chicken Salad. I finally got around to recreating the chicken salad at home. Let me tell you - OMG! This was SO good! It might be better than the original! Serve this on a croissant, on top of a salad, with crackers or on toasted bread. The secret ingredients in this chicken salad are curry and smoked almonds. Don't skip either in this recipe! I didn't think that I liked curry, but I loved it in this chicken salad. I used half of a rotisserie chicken in this recipe. Rotisserie chicken is my go-to for cooked chicken in recipes. It has great flavor and is super convenient. 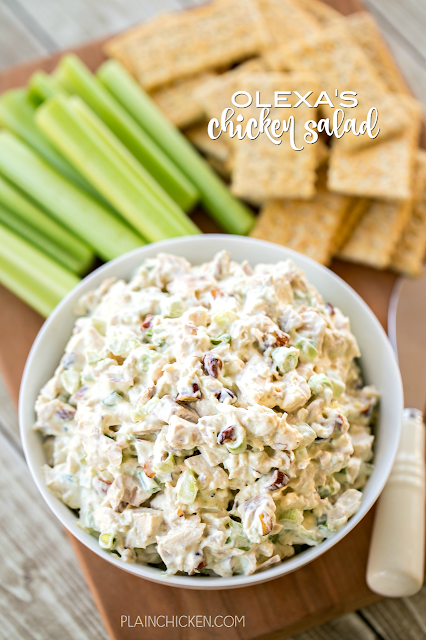 This chicken salad can be made ahead of time and stored in the refrigerator for up to 5 days. In medium bowl whisk together mayonnaise, sour cream, lemon juice, curry, salt and pepper. Stir in remaining ingredients. Coat evenly. Cover and refrigerate 25-30 minutes before serving. I made this tonight and it is fabulous! The combination of everything is perfect. Thank you and Good Job! YAY! SO glad to hear that you enjoyed it! How much raw chicken do you buy to yield 2.5 cups? I usually use about half of a rotisserie. If you are cooking raw chicken, about a pound of tenders or 2 breasts (depending on the size) should be enough. Hi! I made this today and used bacon salt, since I was out my on almonds. Thanks for sharing so many of your recipes, which tend be be my go-to! This is perfect for the "5 Buck Clucks" sold each Friday from my husband's store in Mt Brook Village. $5 Rotisserie Chickens every Friday - I'll definitely be making this recipe soon. Thanks! Awesome even without the smoked almonds!